Dylan is a Bernese Mountain Dog getting chemotherapy at the Virginia-Maryland Regional College of Veterinary Medicine in Blacksburg. 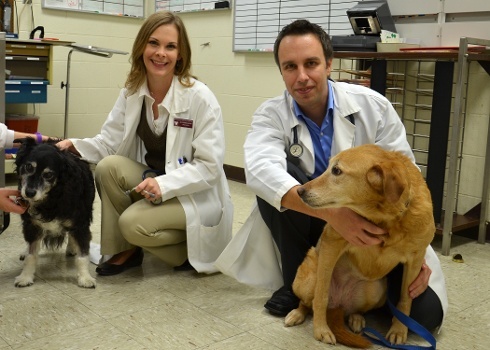 The school is offering a new service with the help of Doctor Shawna Klahn and Dr. Nick Dervisis. A biopsy showed cancer in Dylan’s lymph nodes. Dylan is only four years old and the treatment he is getting, is expected to give him a better quality of life. “There are no hopeless cases for us,” Dr. Dervisis says. Doc is getting chemotherapy for a rare spleen cancer in cats. He is one of more than 70 patients that have gotten chemotherapy in the six weeks it has been offered. Safety in administering the chemo drugs is extremely important. From custom fitted face masks to gloves that are more durable than the typical latex everyone in the oncology department is working toward the same goal. “Providing hope by improving their quality of life slowing down most of the cancer,” Dr. Dervisis says. 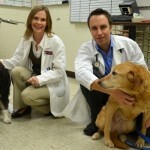 Link to Virginia Tech Veterinary Medical School. This entry was posted on Monday, December 24th, 2012 at 10:30 pm	and is filed under Cats, Dogs, Medical Issues. You can follow any responses to this entry through the RSS 2.0 feed. You can leave a response, or trackback from your own site.